This machine is designed to manufacture square bottom paper bags without handles from sheet paper, and it is an ideal equipment for processing mid-to-high-end paper handbags. By implementing steps including paper feeding, line imposing, side gluing, tube forming and bottom forming inline, this machine can effectively ensure high-quality paper bags as well as save labor costs. Equipped with advanced pre-heap paper feeder, this machine can realize non-stop feeding, thereby improving the production capacity. Perfect water glue and hot-melt glue application devices ensure that the machine can process various kinds of paper, thus being able to produce different excellent paper bags, which are especially suitable for food, clothing and luxuries industries. 1. This machine can make 2 different kinds of paper bags without handles according to customers' various requirements. 2. 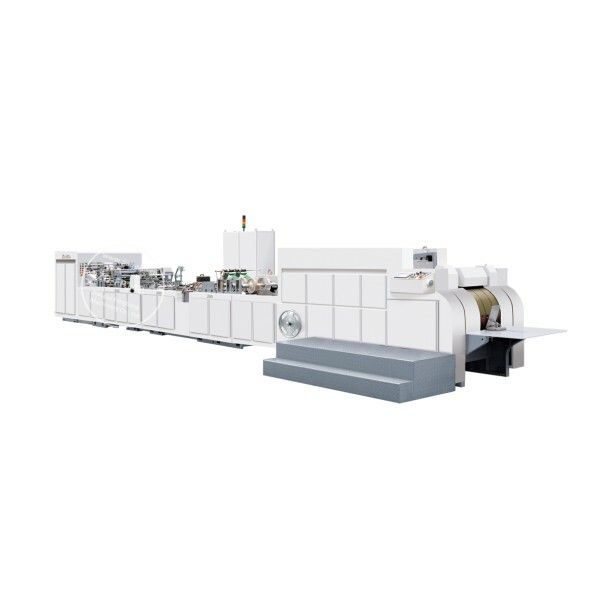 This machine can process various kinds of paper, such as kraft paper,woodfree paper,coated paper and ivory board(including laminated paper),etc. Jiangsu Fangbang Machinery is a high-tech enterprise including research and development, production, sales and service, located in Suzhou, China, covering an area of 26600 square meters. Our company is specialized in the production of paper bag making machines (sheet paper feeding, roll paper feeding, full-automatic, semi-automatic) and flexographic printing machines and so on, with more than one hundred sets of processing and testing equipment in the workshops. All of our products have passed through ISO9001:2008 and CE quality system certifications. With the trade mark of "jianshe" brand, our company has the right to import and export. Now we have more than 30 offices in China and abroad, have established a perfect after-sales service system to ensure that we can provide strong technical support and attentive, efficient service for customers. “Be dependable friend of customers” is our purpose, “Create value for customers” is my goal. “jianshe” brand products are your best choice; we sincerely welcome old and new customers to cooperate with Fangbang and make progress together.